From the ruins of Rome to ancient Sumerian ziggurats, the study of the past inspires students to inquire about ancient civilizations and think about charting a course for the future. At Austin Prep, sixth-graders explore history through the lens of cartographers, museum docents, and archaeologists, learning about ancient cultures while finessing skills in research, writing, and analysis. The sixth grade year culminates with a mock archaeological dig. Small teams of students create artifacts and documents that are buried as they engineer a dig site for a team from another section. Armed with brushes, grid-lines, and a desire to solve the clues left by classmates, other teams then meticulously dig up their mystery civilization and piece together a historical narrative. 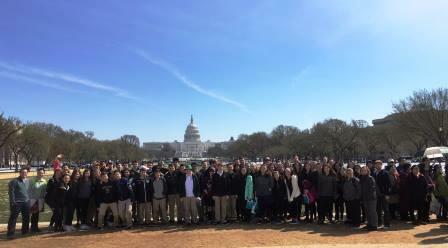 As the culminating experience of their study of Civics, our eighth-graders travel to Washington, DC to explore our government and celebrate our national heritage. Click the photo for the travel blog, written in students' own words. This exciting course that encourages and explores young learners' curiosity and inquisitive nature is an introduction to important social studies skills and concepts. They delve into the core of how and why civilizations emerge, thrive, and eventually falter. The course aligns strongly with sixth graders' Theology and English Language Arts curriculum, emphasizing to students how their subjects are connected. Students engage in many cooperative learning activities, experiential exercises, and unique hands-on projects. They design and participate in a scaled archaeological dig from the Roman Empire and develop a "museum" of Ancient Egyptian artifacts. Students become cartographers through an in-depth study on world geography. The Ancient Diaries Project uses creative historical writing as an outlet to identify and analyze how and why people change over time. Students also have the opportunity to explore the Fertile Crescent, Ancient Greece, Ancient India, and the Byzantine Empire. This course offers abundant opportunities for exploration within historical studies, with students diving deeper as they scaffold upon the skills and concepts they mastered in sixth grade. The seventh graders engage in unique quarter-long projects such as the medieval Europe news broadcast and a persuasive, interdisciplinary travel agent presentation. The course will continue to emphasize cooperative learning and creative project-based learning while building on the essential skills of primary source document analysis, historical research, and presentation. Students also probe such intriguing topics as Mesoamerica, early North America, Medieval Europe, a full study of ancient and medieval China, and the Age of Exploration. Perhaps most exciting of all, students begin to make thoughtful connections between the history they're learning and real current events happening around the globe. The course launches into an introduction of government in general, followed by a more in-depth exploration of American Government and its roots in the American Revolution. Learners engage in activities such as making a board game that explains how a bill becomes a law and holding their own town meeting. This civics and government-based study culminates in the annual eighth grade trip to Washington D.C. Next, students will study how economic systems influence our country and our own decisions. Finally, students will analyze the historical backgrounds of the major world religions. Projects outside of class range from designing a Facebook page for a political figure to interviewing someone they know about a historical event they witnessed. With a developing understanding of the world of politics, government, and religion, students will be able to have frequent discussions about global current events.